The Flotation Trac Implement Radial is characterised by its all-round capabilities, making it the perfect tyre for both arable and pasture land and for intensive transport activities. Its innovative tread profile and strong, flexible carcass construction have been designed to deliver top performance and prevent damage to the soil structure – whilst maintaining the ability to carry out transport activities at relatively high speeds. 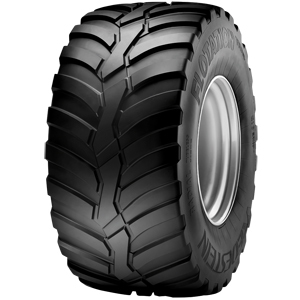 Wide and flat tread contour with rounded shoulders preserves the soil structure and minimises rutting and crop damage. Strong sidewall and robust bead construction ensures optimal durability and protection against punctures, cuts and abrasions. Stable central tread section with open shoulder design ensures excellent operator comfort, optimal self-cleaning properties and enhanced traction characteristics.